This past weekend my husband and I went to a benefit for the Wounded Warrior Project (http://www.woundedwarriorproject.org). It was, as the program announced, “a fully enacted stage adaptation of the entire album and motion picture” of Pink Floyd’s The Wall. The musicians, dancers, stage and front of the house crew and a host of others all donated their time and their considerable talents. The show—the really good, professional show—was performed only twice, one night only. Although both shows were sold out, at $30 a ticket in a 99-seat theater–well, you can do the math. But as with any good event, the amount raised should only be a part of what you are trying to accomplish. In the case of this show, for example, a lot of people, including me, learned about the organization. As we told people about our weekend, I don’t doubt that many did what I’ve been doing—telling people that I went to a benefit for the Wounded Warrior Project. And I’m sure that they’ve had the same responses I’ve had: A small but motivated number of people who expressed interest in learning more about the organization. Events are notoriously inefficient ways to raise funds. Despite all the stories you hear about galas that “brought in” millions, the sad truth is that on average it costs $1.33 to bring in $1.00 via an event. But there are many other reasons why you would have one. The same could be said of any fundraising initiative. A direct mail acquisition is another technique that typically costs more than it brings in, but–like events—it can serve a number of purposes. And for all the talk about the internet it is neither free nor, for most situations, profitable. But again, raising money should not be its only raison d’état. Before you do anything—fundraising especially but not exclusively—ask yourself what you are hoping to accomplish from this act. Raise money, yes, but what else? Perhaps you are hoping for publicity. Or to bring new people to your organization. Maybe you want to thank existing donors. Get greater involvement of your Board. All these are things that can be accomplished while you are trying to raise more money. 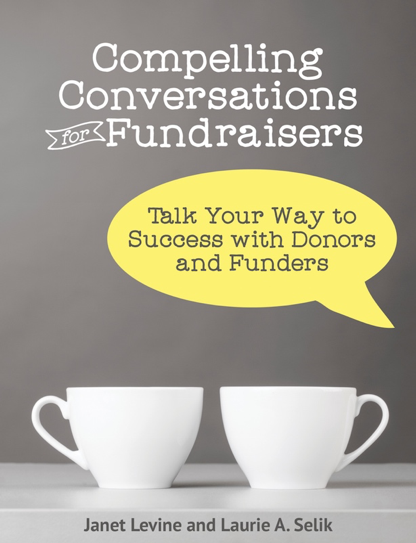 Too often, fundraising is thought of as being singular: One event, one ask, one appeal. And it has one purpose. Raise funds. But that is missing the larger point. Fundraising does not stand alone. It is not off to the side of your organization. More importantly, it doesn’t happen in a vacuum. Fundraising is as much a part of your organization as your administration and your programs. It must be integrated and valued as much as these other two areas. As much time should be spent in board meetings talking about fundraising as is talking about the financial statements. Statements, I might add, that few members really read or understand. When you think about fundraising as an organic part of your organization, then and only then can it really effect how your organization works. Until that time, fundraising will serve only as a way to play catch-up or at best, way to keep the status quo. Both financially and in the larger scheme of things. This entry was posted in business practices, communication, cultivation, development, fundraising, nonprofits, prospecting, relationships, special events. Bookmark the permalink.